As an internet marketing company, we’ve been able to work with a wide variety of companies in the Seattle area and abroad whose internet marketing problems have been all over the board. Now, from my comment there, you may be thinking that the list of possible problems on the marketing problem board is quite large – actually, it’s not. Usually, when companies come to us they are focused on variations of problem number 3. Is this the answer to their problem, though? This process of thought isn’t a negative thing. I believe that it’s a good starting point when it comes to assessing one’s company, because it demonstrates that one is being intentional about solving their sales problems. The only problem is that the application in solving that sales equation is quite a bit more involved. Read on to learn more. When it comes to the problem of not having enough sales, it’s important that companies not automatically solve for that bottom of the funnel bottleneck with promotional marketing (standard marketing). The reason is that there are quite a few potential issues that open up at this end of the equation. Here are the questions that must be asked. Is there a problem with my sales team or the ecommerce checkout solution? We’ve seen several companies working to solve for sale, who immediately arrive at the conclusion that they need more promotional marketing, when the issue is a sales/ checkout one. Upon analysis, we would find out that they had plenty of the right traffic and leads, but the final stage needed to be fixed – the handling of the potential sale. In this case, there may be training and refinement needed for the sales team. Or, in the case of the ecommerce solution, the checkout process may need conversion rate optimization and testing. Is there a problem with the way I ask for the sale online? Some companies will have plenty of traffic, leads, and a good sales team, but don’t ASK for the sale correctly online. This is a bottom of the funnel problem that could be causing your entire sales volume issue – in spite of the fact that other aspects of your company’s marketing system are healthy. We address these issues with a process I mentioned in the previous section – conversion rate optimization. You can find out more about that here. Am I getting the right type of visitors on my website? There are times when you may be asking all the right questions on your website to make the sale. The problem may be your traffic. There is an entire target market out there for your company that is willing to purchase your product or services. But, if they aren’t reaching your site, you’re putting the wrong effort into your marketing. This is a pretty hefty topic, but it involves both: A) Persona development (understanding who your best clients are and targeting them, and B) optimizing the stage of interest you use to put your company in front of them. To learn more about understanding who your best clients are (persona development), click here. Make sure to read more about persona development if you’re not familiar with it, but, in the meantime, let’s look at part B. There are basically three different ways you can appeal to your target audience. Hope that you reach them by putting your brand in front of them with a call to action, but no context for them to be interested in your product. A great example of this would be billboards. Put your brand in front of them with a call to action that’s only relevant because your product or service is part of an industry or subject they’ve displayed interest in. A great example of this would be display advertising on Facebook or another network. In this case, users have given you some context of interest. For Facebook, perhaps their habit data has shown an interest in mechanics in general – and you offer mechanical services. So, your advertisement gets shown to them. If they’re on another network, the theme of the website they are on can give context for what they may be interested in (If they are on a site about sleeping, they may be interested in products having to do with better sleep). Put your brand in front of your target audience when they’ve asked for something you offer. We often refer to this as marketing to someone’s point of interest or intent – and we’re not talking about a general interest. We’re talking about marketing to your target demographic when they show intent to buy or learn more. This is the power of search engine marketing. Whether it’s search engine optimization or Pay Per Click advertising, the power of proper search engine marketing is that it allows you to put your company’s services or products in front of people who display intent about what you offer – whether it’s purchase intent, or information related intent. This process still takes refinement as not all keywords or phrases have equal purchase intent, but this resource, I believe, is one of the most powerful mediums most companies have when it comes to growing in sales, starting to make sales, or proving a business model. Let’s take a look at practical application. Because solving for sales issues can vary so much between companies, it’s important that a tactical analysis of the problem, followed by testing and implementation, is on your marketing radar for your company’s next stage of promotion. The great thing about this process is that companies have seen bottlenecks freed up in a relatively short amount of time that wouldn’t have occurred if solving sales volume was only being done via promotion based marketing. Once your sales funnel is freed up from major bottlenecks, the opportunity for expanding is much smoother and scalability is on the horizon. Of course, not all cases are solved quite this easy. For some companies, solving for sale is actually a problem with all three parts of the funnel – no traffic, no leads, and no sales. This requires more work, but there’s a lot of opportunity moving forward by using a data based marketing solution for your company. 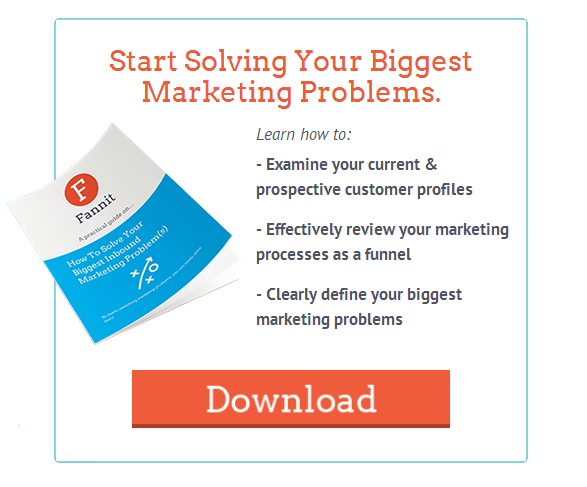 Learn more about what our company can do for you by downloading our free ebook on How To Solve Your Biggest Marketing Problems or by scheduling an appointment at 206-203-8415.